Hi! Felix here with another play-through. This is about the moment when I get weird faces when asking friends if they want to play this particular game. Well, the name and colorful artwork of this simple but deep game can be deceiving but for those of you who are looking for a game that even the least board game enthusiastic person can enjoy: this is it! In Love Letters you play a courtier trying to gain the princesses hand in marriage. In order to do so, you have to get her to like you, which you are trying to achieve by sending her love letters. You do this by a: controlling the person the closest to the princess by the end of a round or b: kicking all other suitors out of the game. 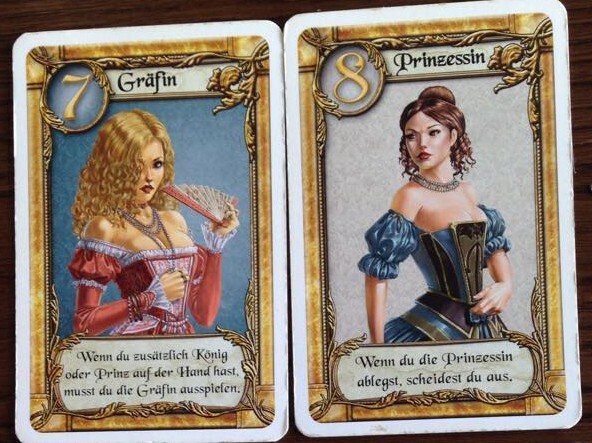 The cards of the game represent different member of the royal court. You hold one card at the time and when it’s your turn you pick a card and play one of the two cards now in your hand. Every card has an effect that comes into play when you play it. For example guessing what card another player has or forcing another player to drop his card and pick another. 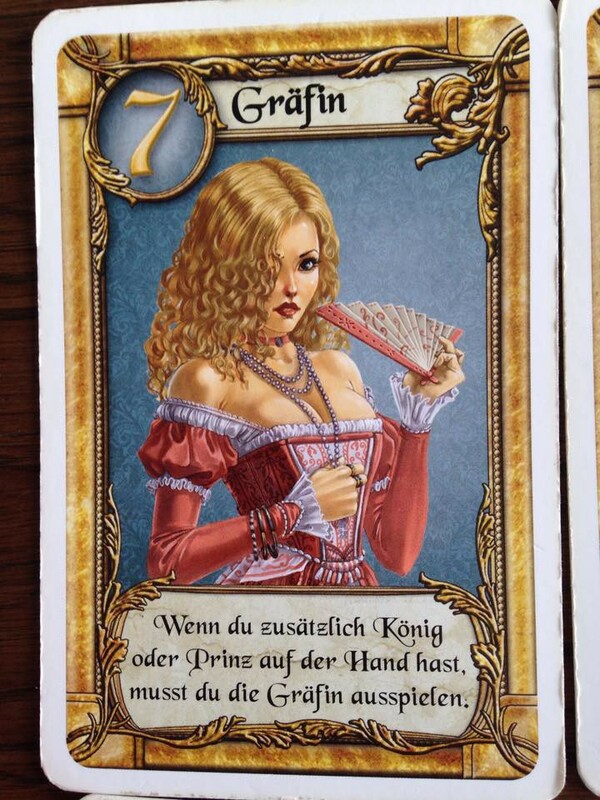 The highest card is the princess herself which makes you lose the game if you drop her and trains your poker-face to levels you didn’t know you could reach. The player with the highest valued card at the end of one round (or the one still standing) has his letter delivered and gets a heart from the princess as a token of appreciation (probably taken from some poor peasant but that’s just my interpretation…). The first player to amass 3 hearts win. A full game usually takes about 20-30 minutes and has all players asking for more. Short lived alliances are build and acts of treasons are committed… all the good components of an entertaining game. The artwork is a bit over the top for my taste but it’s very pretty nonetheless. The simplicity and fast learning curve of this games makes it one of the most played game in my collection and the face on new players is priceless when they first see the cover. PS: I wanted to think of clever captions for the images but the only thing that comes to mind is “bewbs”.